This steel broad ax was given to Carry A. Nation, a devout Christian and nationally recognized temperance advocate. Nation, a resident of Medicine Lodge, Kansas, achieved infamy for attacking saloons with a hatchet to discourage drinking and was frequently jailed for vandalism. In January 1901, Nation embarked on a highly publicized trip to Topeka, Kansas, to attend a meeting of the Kansas Temperance Union. During her trip, she assaulted multiple saloons while brandishing axes. According to Robert Scott, an employee of a Kansas Avenue hardware store, Nation entered the store during a raid on a nearby saloon and asked, "Mr. Scott, have you a hatchet I could use?" Scott provided Nation with this axe. 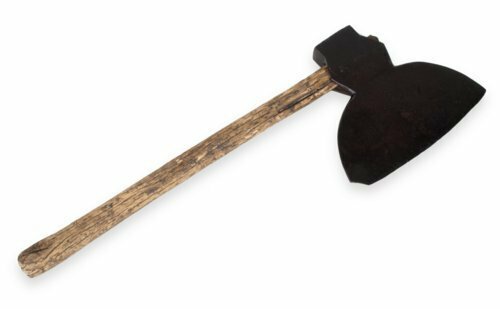 William Beatty and Son, a long-established tool company located in Chester, Pennsylvania, produced the axe.